Very nice stucco 3 Bedroom, 2 Bathroom rancher on the West side! This home has main level living with a ramp from driveway to rear trex deck entry. 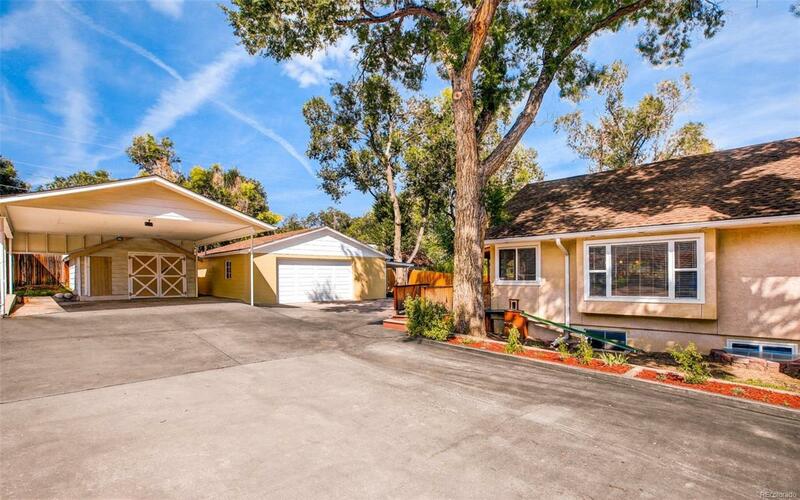 This property boasts the following items: Low maintenance stucco exterior - Updated Wood Floors. Updated kitchen cabinets and granite counter tops. Updated main level bathroom. All new electrical upgrade. Beautiful covered Trex deck. Over sized 3 Car Garage 900 S.F.. Large storage shed 19' X 15' with air compressor. The Carport is 26' X 23". Newer furnace, New 50 Gallon Natural Gas Water Heater all new kitchen appliances. New vinyl windows. Just 5 minutes to I-25. Situated on a large 10,000 + Sq Ft Lot (0.24 Acre). This property is a Mechanics Dream or Craftsman's paradise. With the huge carport you can accommodate large vehicles next to the garage/workshop. Garage has new insulated garage door. Plenty of additional space in storage shed for gardening and lawn equipment. Built in air compressor system completes the dream. Offered by Harmony Real Estate Group, Inc..